Dying to get away with the family, but don’t want to have to sift through mountains of child-friendly escapes? We’ve got you covered. What: The sprawled out 6-bedroom Villa Basilio sits on 2400 sqm of lush tropical garden with mature banyan trees, frangipanis and bamboos – perfect for kids to run around in. It is located at the end of a network of charming lanes in the heart of Seminyak, the area known for its exciting shopping, dining and nightlife. Recently extensively renovated and redecorated, it reflects the high standards of its owners – the people who created, designed and developed the world-renowned Pantai Lima Estate. Known as one of the most spacious villas in Seminyak, it houses not one, but two swimming pools, 6 air-conditioned double bedrooms with 5 bathrooms – 4 of which are situated in the main villa, while the other two are located in separate buildings at each end of the garden. Why: So much space for the kids and the young at heart, plus we love that whilst you’re in the heart of Seminyak, the outside world does not intrude, yet is there on your doorstep and for the taking should you wish it. What: As a pioneer to Maldivian resorts, Kurumba Maldives modernises traditional and local cultures, offering superb hospitality to guests from across the world. Housing 181 villas across multiple levels, there are nine styles to choose from, including ocean-facing, beachfront and garden or pool units. 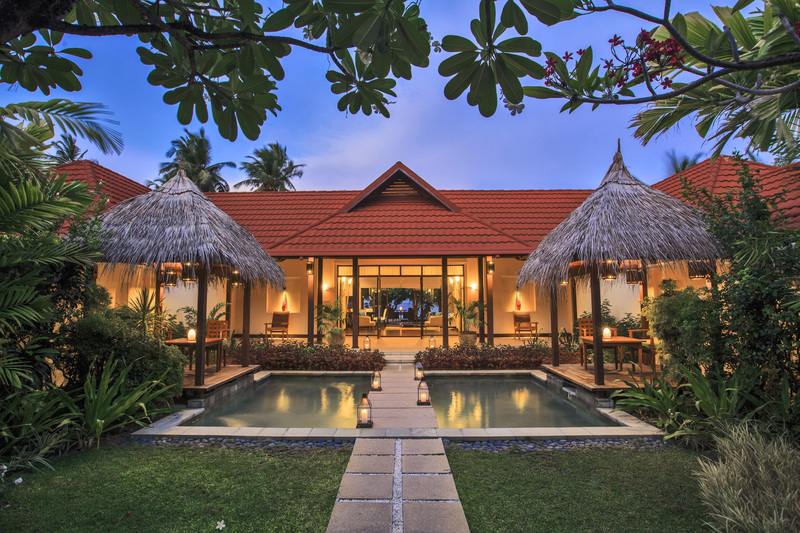 Each villa is warm in hues, high in ceiling and calming in ambiance with a cosy interior to make you feel at home. Its worldly list of restaurants will intrigue your taste buds while the resort’s menu of weekly entertainment provides a getaway of music, culture, party and learning. Keen divers can also be rest assured that diving excursions and courses are PADI-certified, by world-renowned company called Euro Divers. In addition, the resort is also close to this island nation’s beautiful coral sites that are currently in good care. Why: There’s a designated Yoga pavilion for parents to get some peace of mind, and the Majaa Kids Club (4-12 years) for the younglings come complete with Wii video games, handicrafts and beachfront games among others. Plus, Kurumba’s list of weekly entertainment range from jazz nights to Boduberu dances on the beach – perfect for the entire family! What: Set amidst a landscape of verdant rice plantations and the luscious Goa beach, Alila Diwa Goa is a sanctuary of contemporary elegance inspired by traditional Goan design featuring steeply pitched roofs, ceiling high columns, cool verandas and tranquil courtyards. The 153 rooms and suites offer havens of space, comfort and serenity, while the resort’s new Diwa Club is an enclave of exclusivity, boasting luxurious Club rooms and privileges at its own private lap pool with an open air Jacuzzi and hot tub, as well as private all-day dining, dedicated Spa Alila for Asian and Ayurvedic healing, a fitness centre and even a salon. Why: Well thought out, the kids club and the teen zone serves to keep your little ones happy & entertained, so that parents can have some me-time. Perfect ambiance for complete rejuvenation. What: On the tranquil side of Phuket island lies Villa Kalipay – a private villa, trimmed to an idyllic perfection for your tropical holiday. This spacious villa has five bedrooms to accommodate a large family or two. Plush linen on large beds, contemporary conveniences and pristine white marble floors – all areas in the house are enveloped by floor- to-ceiling windows, exposing gorgeous blue waters from the Andaman Sea. Expect to find appealing designer furniture and art pieces from Nepal, Thailand and the Philippines that brings out the chic side of this villa. Why: It’s located in the peaceful Bay Yamu, but only 20 minutes away from Phuket’s entertainment and activities hubs. Kids and adults alike will love the cinema room with modern Sonos systems, large screen projector, Blue Ray player and Karaoke system, while the impressive 13-m infinity pool with designer lighting & sound system will keep mini nomads busy all day! What: Discover one of Boracay’s finest hospitality at Discovery Shores Boracay! Situated along the island’s famous White Beach, this resort offers some of the most beautiful beachfront accommodations in Asia. As a plus to its 88 suites on-site, one can expect world-class amenities and staff attention at your service throughout your stay. The large glass walls in every suite let in plenty of natural light and breathtaking views from the beach and beyond. The wooden details provide a sense stillness with every step you take as the ocean breeze from outside exudes natural peace, allowing you to have a serene getaway. This form of tranquility is complemented with the range of activities available around Boracay as this exciting island has so much to offer, from watersports to sailing and plenty of fun on its famous beaches. Why: Adults will love the resort’s Indigo Restaurant that has been featured in Philippine Tatler’s Best Restaurants List, while Terra Wellness Spa offers a holistic and custom-designed East-meets-West approach. The whole family can also partake in fun activities including island hopping, paraw sailing, skim boarding and luxury catamaran sailing. What: Maison L’Archipel is beautiful neoclassical villa in Santorini, just 10 minutes away from the town center. The main house consists of 3 stunning bedrooms, 2 bathrooms, as well as a kitchen, a living and a dining room. The master suite and a second bedroom of the main house features a queen-sized bed and en-suite bathroom with a cyclical bathtub made out of off-white polished cement, combined with sky-blue plaster on the walls. Both rooms also feature a vaulted ceiling with fan and solar chimney. We love the third bedroom on the upper floor of the main house, because it boasts amazing sea views. Details such as the beautiful dining area with its cross-vaulted high ceiling, wooden table and chairs, old gold plated mirror, marble fireplace and an original Venetian chandelier only make the space more authentic and chic. The main highlight though is the living area’s unique view towards the city, the Caldera bay and the impressive volcano. Why: Privacy for all its guests, so teenagers can feel like they are on their own holiday, thanks to the 2 guest studios, which are connected with the house terraces and has its own private entrance. Like what you see? We have more getaways here!